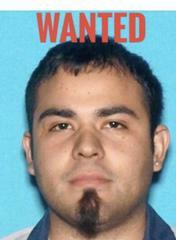 Enrique Alberto Lazaro-Valencia wanted for MURDER & is considered armed & dangerous! On September 16, 2018, at 1:00 a.m., officers assigned to the Perris Police Department were dispatched to a report of a shooting near the intersection of B Street and Red Maple Place in the city of Perris. When officers arrived, they located a male suffering from a gunshot wound. The male, who was pronounced dead at the scene, was later identified as Arturo Angel, a 26-year-old male from Perris. Detectives from Perris Police Department and the Central Homicide Unit responded and assumed the investigation. Further investigation revealed that Enrique Alberto Lazaro-Valencia, a 29-year-old male from Moreno Valley, was involved in the death of Angel. Lazaro-Valencia has an outstanding warrant for his arrest and investigators are actively looking for him. He is armed and dangerous. The investigation is currently on-going and no further information will be released at this time. If anyone has information regarding this investigation, they are encouraged to call Detective Salisbury with the Perris Police Department at 951-210-1001 or Detective Mullins with the Central Homicide Unit at 951-955-2777 or our 24 Hour hotline at 951-888-1108.